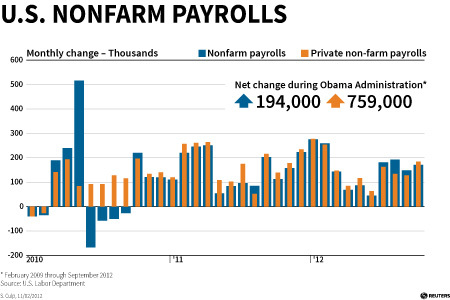 Friday’s employment report was relatively OK, and good for Obama, with 171,000 job gains. But 32 months from the bottom and only half of lost jobs have been recovered. What’s clear is that each recession is becoming harder than the last, hinting at larger structural problems. U.S. nonfarm employment increased by 171,000 on a seasonally adjusted basis in October, according to a Nov. 2 report from the Bureau of Labor Statistics, while the unemployment rate rose by 0.1 percentage point to 7.9 percent. August and September job creation figures were revised up by a total of 84,000 jobs. In the 32 months since the jobs nadir in February 2010, 4.5 million jobs have been created, 53 percent of the 8.4 million jobs lost from 2007 to 2010.